The Natural Resources Conservation Service contracted services to rehabilitate the Tibble Fork Dam, which was originally constructed in 1966. The goal was to strengthen the dam and raise the reservoir by 9 feet, increasing capacity for agricultural and recreational use. 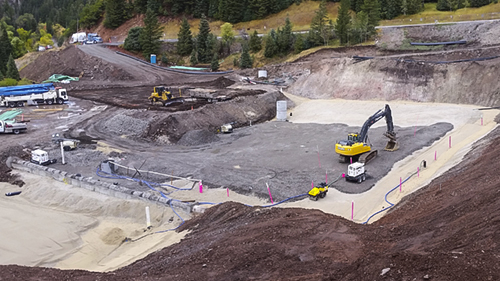 The scope of the overall project includes: raising the dam embankment 15 feet, replacing the spillways for increased capacity, installation of a new toe drain, construction of a stability berm, dam foundation seepage remediation (including installation of a SCCB slurry wall), and excavation of reservoir sediment. 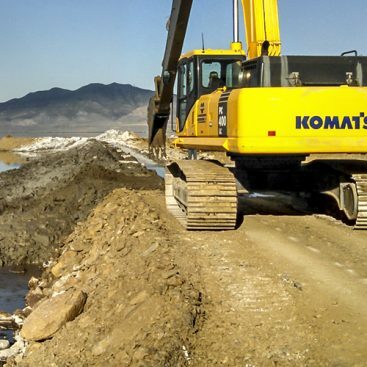 The SCCB seepage cutoff wall was installed with a Komatsu 1250 equipped with Geo-Solutions’ custom long stick boom and stick. The wall was installed in two overlapping sections. The deeper section was excavated with at 36-inch bucket to accommodate the width of the long reach boom, and the shallower section was excavated with a 30-inch bucket. The self-hardening slurry was chosen because of the restricted space available near the work pad, and Geo-Solutions included slag in the mix due to the need to achieve the low strength requirement of <50 psi, and the low permeability requirement of 5×10-7 cm/sec. Extreme caution was taken while digging around the live wet well in order to prevent damage to the well, or contamination of the reservoir water. The wet well remained in service during the barrier wall installation so that the reservoir level could be controlled. Where possible, the wall was keyed into the “Tuff” bedrock material to a depth of 5 feet. In several areas, a cemented conglomerate layer above the key material prevented digging to design depth. The second section of the wall was installed along the right abutment, and the alignment was entirely on a 9% slope. A second mix design was used which included additional Portland cement content. This mix set up more quickly, generally in 1 to 2 days, to allow a “step-up” sequence. This section of the wall was done in alternated cuts between opposite ends of the alignment every day. This allowed each cut additional time to set up. The right-abutment section of wall crossed the main wall alignment with a 5-foot overlap to provide a continuous seal. The SCCB slurry was mixed onsite using water from the creek flowing into the reservoir. The slurry was mixed using a continuous mixing batch plant adjacent to the slurry wall. The primary mix design was comprised of Slag cement, a very small amount of Portland cement and bentonite. The bentonite was pre-hydrated by adding it from 3,000 pound jumbo sacks using a venturi mixer. 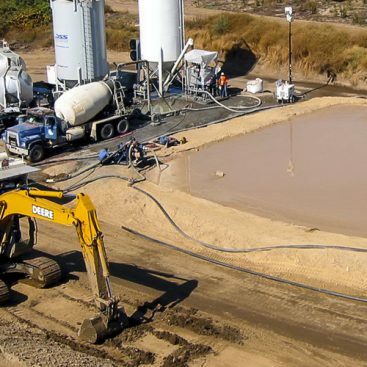 An 18,000 gallon mixing tank was used to store, hydrate, and mix the bentonite slurry. Slag addition was monitored using a density meter on the batch plant, and Portland cement was added by the bag (92.6#) as per mix design. The slurry was pumped through a progressive cavity pump and delivered to the trench. The primary focus of the mix design was a low permeability product with a target of 5×10-7 cm/sec. Because of the low strength of the mix, especially on the first section of the SCCB wall, the top 2-3 feet of the wall was excavated out to solid ground and covered with a geo-fabric and a cement cap. After the installation of the SCCB wall, Geo-Solutions completed the grout curtain. Geo-Solutions subcontracted the drilling for the grout curtain beyond the end of the CB wall into the conglomerate outcropping on the left abutment. This curtain was installed by drilling a series of 15 holes, the last of which tied into the CB wall. Geo-solutions followed the drilling operation with pressure grouting on each of these holes, using upstage grouting techniques. Following installation of the new outlet works, and the abandonment of the existing wet well, Geo-Solutions grouted the zone under the well that could not be reached during slurry trenching. This project had several challenges, many of which were related to the remote, mountainous location. 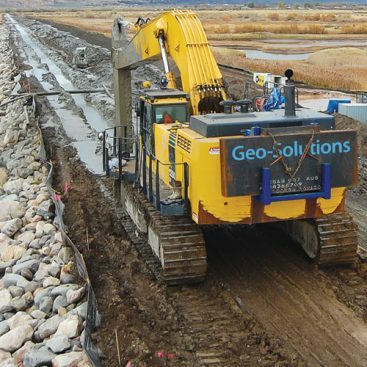 Geo-Solutions worked with the general contractor to coordinate operations around the rest of the remediation operations. Coordination with the general contractor was vital because the lowered reservoir lead to very unstable sinking work platforms and roads. Additionally, the slurry wall crossed all the access roads between equipment storage and general remediation operations. While working on the first segment of the SCCB wall, Geo-Solutions worked very carefully around the live wet well. In this same area, a hard conglomerate material was encountered. Geo-Solutions worked with the contractor to develop a grouting plan that would provide a seal between the conglomerate and the key material. Working in the remote mountain location meant that both the slurry wall and the grouting were done on slopes, making the work platform even more difficult to maintain. The top portion of the second SCCB wall section crossed the general public access road. This required coordination with the State police, and UDOT. Geo-Solutions’ drilling and pressure grouting operations were completed on a 30 degree slope so that the rig had to be tied off to an anchor embedded at the top of the hill.